AlSat-Nano is a 3U CubeSat nanosat jointly developed by the Algerian Space Agency ASAL and the UK Space Agency for rapid and cost-effective demonstration of new and innovative space technologies. AstroTube (formerly SpaceMag-PV) Boom – this will flight test the world’s longest retractable CubeSat-compatible boom which will be able to deploy up to 2 m in length from a volume the size of a cigarette packet. This technology could also form the basis of de-orbit systems for future missions. The payload also carries a magnetometer, one of the most compact of its class, to carry out measurements of the Earth’s magnetic field. Also on the payload will be RadFET radiation monitors, and test tokens of a revolutionary flexible solar cell material. 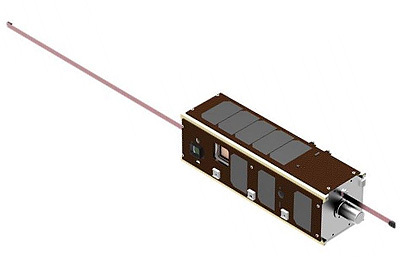 The payload is led by Oxford Space Systems Ltd, collaborating with partners including RAL Space and Bartington Instruments Ltd.
C3D2 – a highly customisable CubeSat camera offering three fields of view and innovative on-board software processing capabilities. The payload will also be a remote experiment of the Open Science Laboratory. The payload development is led by the Open University Centre for Electronic Imaging with sensor hardware provided by e2v Ltd and electronics from XCAM Ltd. Thin Film Solar Cell – this is a novel and potentially step-changing solar cell structure which is directly deposited on cover glass just 1/10th of a millimeter thick. Effects from the space environment will be measured, with the aim of allowing the organisations involved a route to product development and commercial exploitation of this technology. This project is led by the Glyndwr University Centre for Solar Energy Research with contributions from the University of Surrey, Qioptiq Ltd and Surrey Satellite Technology Ltd.
AlSat-Nano will be designed, built and launched as part of an education programme SSC will deliver to Algerian students. The UK Space Agency is funding SSC to design and build the platform hardware and software, and ASAL will undertake the final assembly and testing, launch and operations with expert guidance from SSC. As part of the mission, approximately 1 unit of the AlSat Nano platform has been made available to host self-funded payloads from the UK CubeSat community as a free flight opportunity. Launch is aimed for mid-2016.